The Web Hosting Change Addendum is used when you have to change the specifications or terms on an existing hosting contract. Use this form to change the terms and append it as an addendum to the existing contract. templates are the very best that I have found." This Web Hosting Change Addendum is included in editable Word format that can be customized in Word or by using the included Wizard software. How do you write a Web Hosting Change Addendum document? Addendum: Web Hosting Agreement #Work Order Number. The following is a request to amend the previous established and contracted relationship between Company Name and Company Name and is to act as an addendum to any existing contract or relationship established between the two parties. Authorized changes may also impact delivery dates and milestones. Domains: FTP Accounts. Email Accounts Total: Additional Notes: Bandwidth in excess of 500 GB/Monthly shall be billed at $1.00 per extra GB. This Agreement shall be binding upon and inure to the benefit of Company Name and Company Name and their respective successors and assigns. PAYMENT TERMS: Net 30 days. 1.5% Interest monthly on accounts past due 30 days. The above prices, specifications and conditions are hereby accepted. Company Name is authorized to upgrade the current Web Hosting Package for Company Name as outlined in this Agreement. Payment will be made as proposed above. 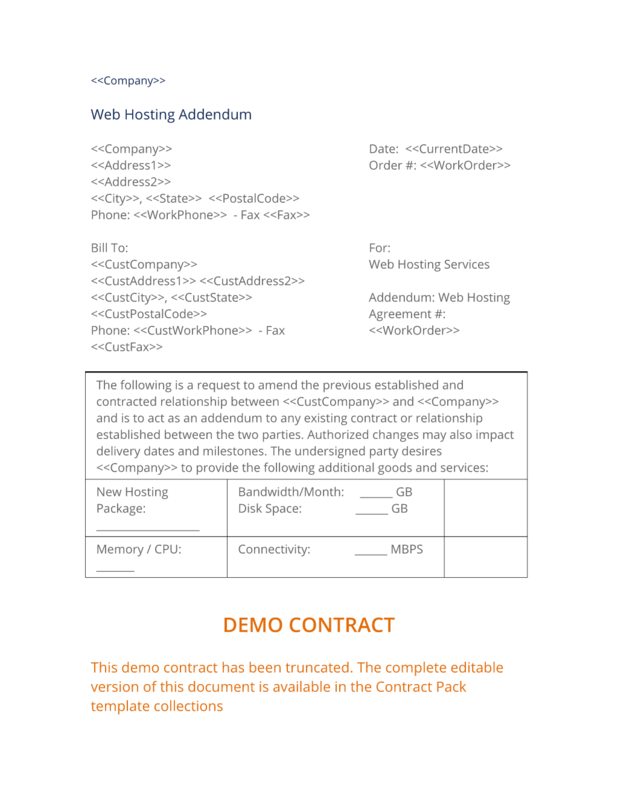 The complete Web Hosting Change Addendum - with the actual formatting and layout - is available in this Contract Pack.